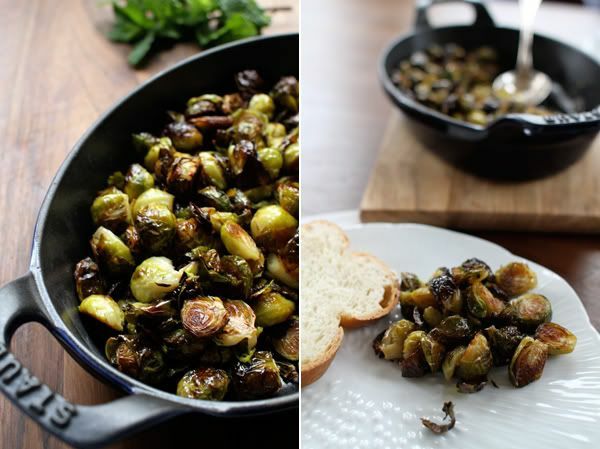 housetohaus: you like brussels sprouts? "The Financial district is my favorite neighborhood in NYC." "Brussels Sprouts are the best." "I'm dying to go to Murmansk." The crazy thing is that he was serious. About all of them. There were others, but I can't remember them, and neither can Zach, even as we sit here trying to wrack our brains about the topics we chatted about this weekend. Point being, sometimes he's joking and sometimes he's serious and the only way to tell is to either ask or to look for that little sideways smirk he makes when he knows he's being funny. He was serious about Brussels sprouts. I, on the other hand, wasn't so sure. Both of my parents hate them. Actively. The mere mention of Brussels sprouts elicits grimaces and gagging noises. I've known people that like them, but I always thought they were either too healthy for their own good or just plain silly. I've only eaten Brussels sprouts a handful of times. I remember my first time. It was a fluke accident, my friend Crem ordered them when we were out to dinner at Momofuku Ssäm Bar a couple of years ago and we ate the entire bowl. I loved them. They were fried and crispy and a perfect mix of sweet and salty, crunchy and soft. I thought it must have been magic, that it would be impossible to recreate them at home, and that I should just go on hating them. But when you're a cook and your husband says he loves something it's hard to at least not give it a shot. So here enters a husband who apparently loves Brussels sprouts, an uncovered magical recipe, and I should note, a wife who came around and now loves the little green sprouts. Zach announced his love as Brussels sprouts just as they came into season. Lucky for him. Every vendor at the farmer's market last Friday was selling them. Some of the sprouts were larger than others, but they were all being sold off the stalk. I had heard that buying them on the stalk is a good way to ensure that they won't be too bitter. No stalk in site I decided to just go for some of the smaller ones, intimidated by the big ones, and the big bites they would entail later. 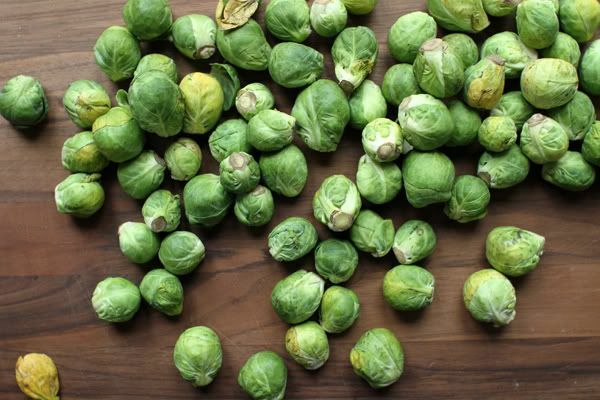 I wanted to learn to love Brussels sprouts little by little, not enormous mouthful by enormous mouthful. I also went with the small ones in the hopes that they would be a bit easier to get nice and crispy. And as you can see below, it worked. It wasn't hard to track down the recipe. It was waiting for me on epicurious.com. The success of this recipe is all in the crispy-ness of the sprouts and of the sweet thai fish sauce based dressing. Preheat the oven to 450, with the rack in the upper third. 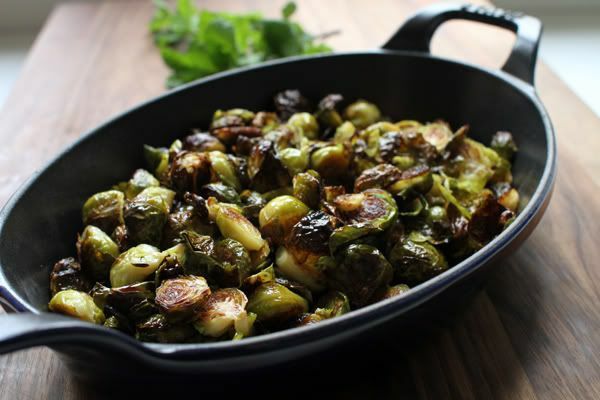 Toss the sprouts with the oil, arrange them, spread out, cut side down on a baking sheet and roast for 40 minutes or until the outer leaves are crisp and very dark brown and the insides are soft. Add butter and toss to coat. Stir together all of the dressing ingredients until the sugar has dissolved. To make the puffed rice cook the cereal in oil and the Japanese spice blend over medium heat, shaking the skillet and stirring, until rice is coated and begins to turn golden, about 3 minutes. Transfer to a bowl and cool, stirring occasionally. 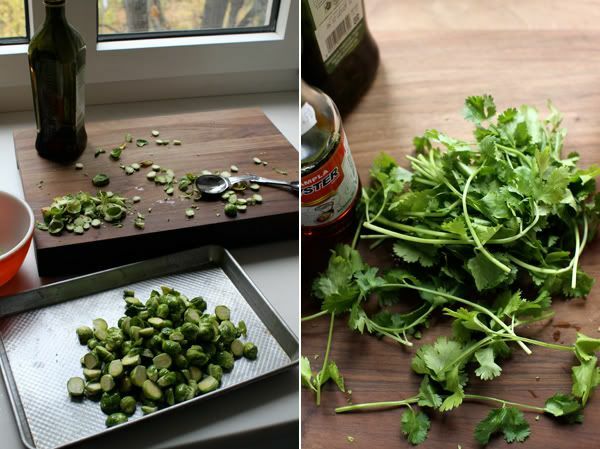 Put the sprouts in a serving bowl, then toss with just enough dressing to coat. Sprinkle with puffed rice and serve remaining dressing on the side. I'm still not quite sure Zach is serious about the Financial District being his favorite neighborhood in the city. I think he just wanted to say it outloud to see how it felt, hanging out there in the open. It just can't be true. He claims to love the narrow, cavernous streets, but can those streets possibly live up to the nooks and crannies of the West Village or the restaurants and bars in the East Village. What about Rue B Zach? Isn't that your favorite bar? Have you ever even eaten a meal near Wall Street? I doubt it. Perhaps he's just trying to support Occupy Wall Street by approving of their home base in Zuccotti Park. Six months working at 14 Wall street (in an architecture firm) was more than enough time for me at the tip of Manhattan. Give me an ivy covered townhouse on a cobblestone street over the caverns of downtown any day. And for Murmansk...perhaps on the summer solstice, but that's about the only time you will get me there. I bet if you go in the winter you'd need to hire a dog sled and rent some fur coats. Mom - "love your Brussels sprouts post, but hate the sprouts." 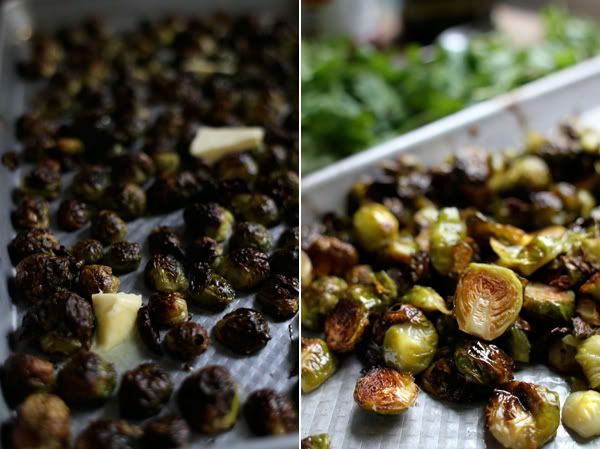 I was a brussel sprouts doubter for WAY too long - now I love them! In fact I bought some today to make for lunch tomorrow :) I've tried roasting but I think my favorite way is frying up a bit of high quality slab bacon (any excuse to eat bacon right??! ), removing the bacon but reserving most of the fat and then sauteing the brussel sprouts in them (I've tried cutting off the stems and halving them or chopping them up into a bit of a coleslaw like mixture...both are delish). ENJOY!! Amanda we are definitely on the same bacon wave length, because that sounds absolutely phenomenal. I guess Zach will be getting his fill of Brussels sprouts this season. Thanks for the ideas! I love brussel sprouts tal- agree with the bacon idea- it's yummy if you finish them with a touch of balsamic too...enjoy!!! ha! I love brussel sprouts and am intrigued by the dressing. I'm wondering how sweet it ends up being? am DYING to make these! First, I must say: both of my parents hate brussels sprouts and I love them! 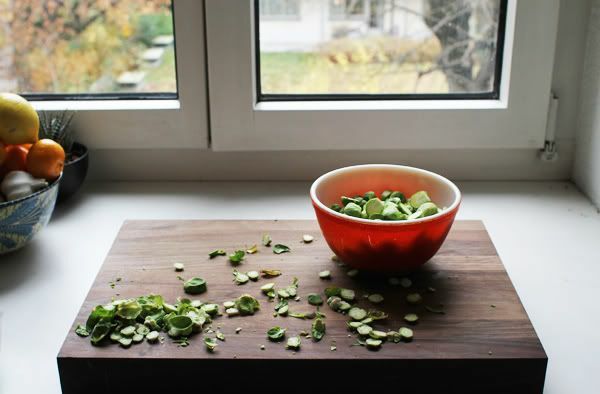 Second, I LOVE Momofuko brussels sprouts and am SO excited to make them at home. 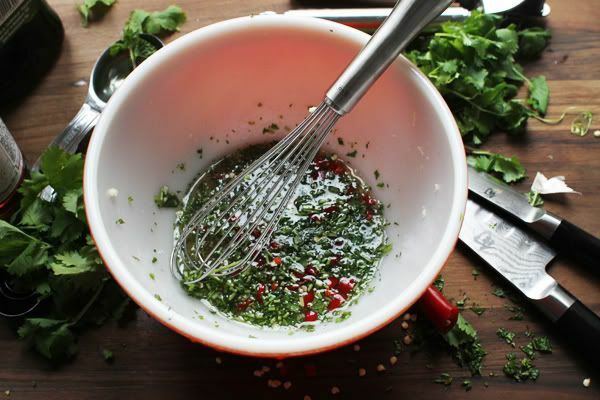 Love, love this post, and stoked about the recipe. For some reason I've always had a hard time making brussels sprouts taste like the restaurants do. This recipe looks great! I'll try it out next time. Thanks for sharing! Kasey - Brussels sprouts + Conditions by The Temper Trap. That was our own person pairing this weekend. Thanks for reading and commenting. I adore your site, and if I lived in the states you can be sure I'd be jostling for a spot on your monthly shipments! Yi - I do know that Momofuku fries their sprouts so I can't promise these will taste exactly the same. But unless you have a deep frier, roasting them is much easier, and healthier. Hope you try them. Talley, what a wonderful post! I have to say, I've always been a Brussels sprouts fan. It may just be that I didn't grow up eating them and that I started buying them at the farmers' market when I was really into eating well. In any case, I was considering doing a Brussels sprouts dish for Thanksgiving with the boyfriend and his parents next week, and I think this might just be it. It's already going to be a pretty non-traditional Thanksgiving (no turkey), and I'm already planning on making a Momofuku dessert, so why not Momo vegetables too? P.S. I envy your photos. Brussels sprouts never looked so gorgeous. Ha! This post cracks me up. I was married for like four years before Ben told me he didn't like rosemary. Seriously?! My family is Greek. We've been throwing rosemary in about half of the things we make for him. He's actually grown to love it, but my goodness, I was shocked. Anywho, these look delicious. 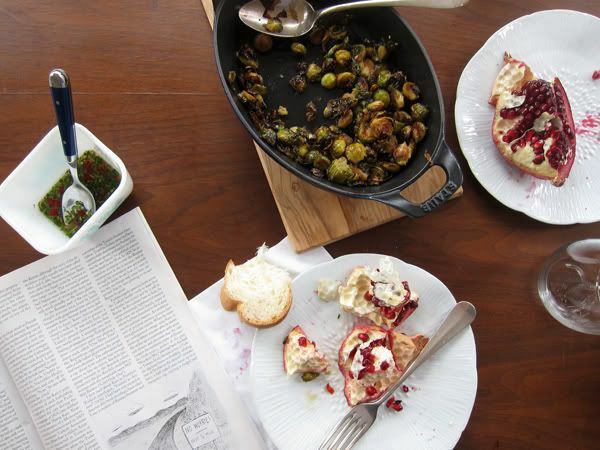 I'm a Brussels sprouts lover — always have been — and am looking forward to this recipe. Also, next time you are in NYC, which I know might be awhile, try the Brussels sprouts at Alta... heavenly! Hi, I'm the twin of themoveablefeasts (Amy), and she showed me your blog awhile ago. I've since been hooked because (besides the wonderful posts and recipes) I'm an architecture student in Seattle and a europhile, and I love reading about Zurich and your other travels! Anyway, I love brussel sprouts and eat them all the time, and so last night I made these and they turned out great! Usually I pan-fry them, but roasting the sprouts and adding the asian flavors were a wonderful change! Thanks for sharing.